This is an Original ACEO miniature acrylic painting, signed by me on the front and details written on the back. 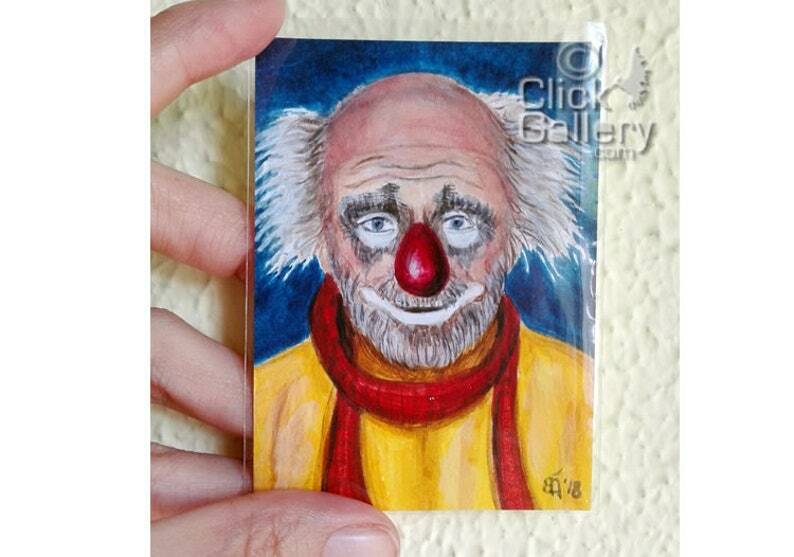 Clown #40 is inspired by Slava Polunin, Russia's best-known artistic clown. He is famous with his Slava's Snowshow which has been a hit in over 80 countries. Materials: Winsor and Newton acrylic paints and heavy-weight paper. It comes with protective plastic sleeve and Certificate of Authenticity. Colors of the image may differ slightly from what you see on your screen. The watermark sign of "© Click Gallery" won't be shown on the original. It is for helping to prevent copyright infringement. If you wish to give one of my artwork as gift to someone but you are not sure about which one is the right one, now you can purchase a Click Gallery GIFT CARD that allows people to choose an artwork that adapts to their own taste and needs.